When you were little, she left you. You do not know why, and for years you thought it was because of you. At a very young age, he molested you, ripped you of your innocence, and now you hate him forever! She was never there for you when you needed her. You needed to feel loved, needed someone to talk to, to mentor you, but she was not there. She worked all of the time. They said you were a mistake, so you were raised by your grandmother because “they” weren’t ready to be parents. Better yet, they placed you in foster home and therefore you have no idea of what a consistent relationship looks like. He had a drug addiction that never allowed him to be normal. You were embarrassed by him when your friends were around because he was always either high on drugs or drunk. She told you, you were fat and not pretty. She always compared you to your sisters or cousins who were “prettier”, leaving you feeling unwanted. Now as an adult, you have nothing to do with her. He made the decision to leave your mother and now your family is no longer normal. You and your mother were not good enough, and now you hate him forever! He abused your mother while you watched and you vowed to never ever love him again! Any of these statements sound familiar or have come across your mind? These statements are thoughts you had towards your parents. My message today is to EMPOWER you to LET….IT….GO! Sure, that is so much easier to say than to do, but let’s look at this on a grand scale. Yes, many of these instances may have scarred you for life. Prayerfully you have sought counseling or some other form of healthy support, but I’m talking about the lasting effects of unforgiveness towards your parents. Many of us hold these deep emotions of anger, resentment, and angst, and cannot move on in our own lives because of it. Many of our parents were either struggling themselves, backs up against the wall, swallowed by their own sins, or just had no clue how to love another human being. This in NO WAY excuses the pain or their actions, but as adults ourselves, some of us mothers, we have to learn to move past these things and literally forgive. The very first time I heard this phrase, it was spoken by Bishop T.D. Jakes. He said, “Not forgiving someone is like you slowly drinking poison while waiting for the other person to die.” To forgive means to release the guilt, the anger, pain, and hurt so that you can move on. Many of our parents have either moved on with their lives or are deceased and we still hold on to the idea of never forgiving them. Sometimes it appears unimaginable to be able to forgive someone for the hurt they have caused. But the tough reality, and I mean really tough truth, is that not forgiving someone is hurting you more than it is hurting them. I will never ever forget the moment when I realized I truly released and forgave my parents for any harm they caused me. Because of that moment, I learned the definition of true freedom. The Bible reminds us, “Who the Lord sets free is free indeed.” I am so free to love them ridiculously and to the point where I am smitten at the very sound of their voices. And that took some time to be able to get there. My life was not a set of crystal stairs as Langston Hughes so eloquently put it. I had to make a choice that I was either going to allow the past events of my childhood to make me angry and insecure or to decide to allow God to fix my heart so that I could fully receive my parents for who they are. When we choose not to forgive, many times it’s because there is absolutely no way we can fathom overcoming such heart ache and tragedy. That is one of the first signs of doubting God. Eeeek, that hurt to type just as much as I bet that hurt to read (hear). But when we do not believe that God can truly come in, fix the damage, and redeem us from our past, we start drinking that poison that soon affects all of our relationships, whether personal or professional. As a result of some of my past, I think I learned to have a stoned face. A face that never flinched when bad news, or something adverse, came my way. That affected so many of my relationships because I never showed emotion during emotional times. I didn’t let people close to my heart because I was scared that they may leave or hurt me. But I have to share this with you, when I let that go, I was able to love so hard without the fear of consequence that it made my interactions richer. I can now love without expecting anything in return because the love in my heart is not man-made nor predicated on what a person can do for me. God filled my cup so that the overflow is now my pleasure to use as a tool to bless people. 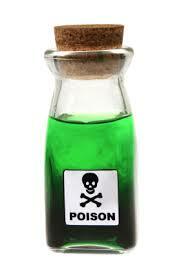 Stop drinking poison….it’s time to start this path of forgiveness. Thank You for giving Your Son Jesus as a sacrifice to die on the cross for my sins so not only can I have life more abundantly, but so I can love freely and take advantage of the liberty that comes with forgiving others. Lord, for every Sister reading this message, may You enter her heart, reveal to her the fears and anger that holds her back and heal her in the name of Jesus! It is my prayer that every heartache, pain, bitter spirit, and resentment is wiped away immediately in Jesus’ name. Lord, fill her cup so that she has peace with her past and joy for her future. And Lord, whether dead or alive, help her in her heart to make it right with her parents. Show her what it really means to honor her parents so that her days are long in the Lord. In Jesus’ name I pray, Amen. My Sister in Christ, I EMPOWER you to start the journey of letting it go. Please don’t think that my message is to minimize your pain because I feel that pain perceived by anyone is very, very real. However, when the moment has passed and the only thing keeping us from moving forward is the hate and anger in our hearts, it may be time to ask God to help you to forgive. There are no special steps, or forgiveness manuals because we are ALL different and our pain is different. But open your heart to God, trust Him, and He will make this right. You can do it!